This product was added to our database on Thursday 18 December 2014. This popular 1930s British passenger bi-plane used for short haul flights was distinctive with its twin engines, tapered wings, streamlined farings as well as its speed and comfort. 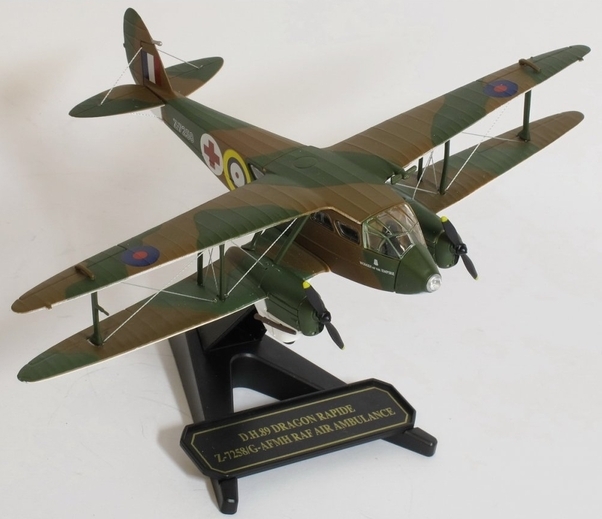 It now has its seventh 1:72 scale Oxford Aviation outing as a military air ambulance, as used by the RAF. Its role is distinguished by the Red Cross markings on the side of the fuselage and it wears its camouflage colour scheme of dark earth/dark green with pale green underside. With RAF identity Z-7258/G-AFMH printed on its rear fuselage, its RAF roundel markings put it as flying in the very late 1930s.